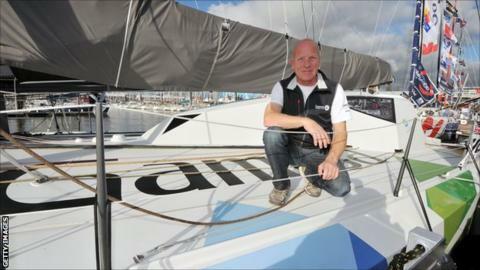 British sailor Mike Golding hopes to emulate Bradley Wiggins as he prepares to compete in the Vendee Globe race. Earlier this year Wiggins became the first British man to win the Tour de France, and Golding believes winning the Vendee would be just as historic. Mike Golding, 52: Three previous Vendee Globes, finished twice (seventh in 2001, third in 2005). Three-time world champion, first person to have raced round the world in both directions. Alex Thomson, 38: Two previous Vendees, never finished. The youngest round the world race winner, aged 25 in 1999. Samantha Davies, 38: One previous Vendee, one finish (fourth in 2009). Only woman in this year's race. 2009 Yachtsperson of the year. In 23 years, only 100 people have completed the non-stop single-handed round-the-world yacht race, which starts at 12:00 GMT on Saturday. "It would be a Wiggins moment for a British sailor to win," Golding said. This year's event will be contested by 20 sailors from five different countries with Golding, Alex Thomson and Samantha Davies all vying to become the first British sailor to win. Davies - the 2009 Yachtsperson of the year - is the only female skipper competing, in what will be her second Vendee Globe, having finished fourth last time out. No woman has ever won the race although Britain's Ellen MacArthur came closest in 2000-01 when finishing second. Only six women have ever completed it. For Golding, this will be his fourth crack at the Vendee Globe and he genuinely believes he can triumph in its seventh year. "I want to be competitive and do the very best I can to bring the Vendee trophy back to England," Golding told BBC South Today. "It would be extraordinary to win it." Golding, who became the first person to sail around the world non-stop in both directions, was leading the Vendee Globe four years ago when his yacht lost its mast in the Southern Ocean. He was forced to abandon the race and sailed under jury rig to Perth, Australia. In the 2004-05 race he finished third, despite his yacht losing its keel on the last day of the race, having previously come seventh in 2000-01, the edition that made a household name of MacArthur. At the age of 52, Golding knows he may not get many more cracks at the race - which is rated as the pinnacle of ocean racing and alongside the Americas Cup in terms of prestige. "It is competitive and adventurous because you are sailing over such an extraordinary distance and anything can happen in that time," he said. Entrants: 20 sailors from five different countries will contest the 2012-13 edition. "It is physically demanding because you are one guy on a 60ft boat and for three months of my life I am going to be immersed in this competitive, adventurous, extraordinary experience. "Everyone who does the Vendee gets an incredible amount of reward from just completing the event but of course my goal is to do a little bit better than that. "The Vendee as that pinnacle event is the one event you do not want to miss in that four-year cycle. Even in a lifetime of sailing you can only probably do it four times so I am extremely lucky to be back out here for a fourth time." The race begins in Les Sables d'Olonne on the west coast of France before heading down the Atlantic, around the Cape of Good Hope off southern Africa and into the Southern Ocean where skippers encounter what Golding describes as "treacherous, hostile, cold and extreme weather conditions" including the added danger of icebergs. The solo sailors then spend about six weeks in the Southern Ocean before making the perilous rounding of Cape Horn, off the southern tip of South America, and heading back up the Atlantic to the finish at Les Sables d'Olonne in February, having hopefully competed "the Everest of the ocean". Or as the 38-year-old Thomson puts it: "It's a very easy course. "You come out of France and turn left, down to the bottom, left at Africa, round Antarctica, left at America and back up to France again." Thomson's claim that the Vendee is an easy course is tinged with irony. He has, after all, failed to complete it in two previous attempts and believes it is the "single-most difficult sporting challenge that exists in the world today". "When you put it into perspective, fewer than 100 people have ever completed it and nearly 3,000 people have climbed mount Everest so it shows the enormity of the challenge and real test of mental and physical endurance," he told BBC South Today. "This will be my third Vendee Globe and my seventh round-the-world race in total and the last two Vendee Globes I haven't finished. Hygiene: To save weight, there are no bathrooms or toilets. Ablutions are of the "bucket and chuck it" variety. Sleep: Skippers actually sleep between three and six hours every day on average but usually not all at once. Food: Just like sleep, skippers' meals depend on how the boat is doing and what the weather conditions are like. They have a choice between freeze-dried food and ready-to-eat meals and once at sea, all they usually have to do is heat it up or add water to it. Entertainment: Despite a lack of time yachtsmen can still indulge in a book, a movie or listen to music. Social networks and the internet are available on board so surfing the web, checking emails and spending time on Twitter or Facebook is possible. "For me the priority is to finish the race. I've been trying to win it and compete in it for 10 years now." Thomson's last attempt at the Vendee was doomed before it began - his yacht Hugo Boss was struck by a fishing boat three weeks before the start, and only round-the-clock repairs got him to the start line. Two days later his race was over as he discovered the boat was letting in water and he was forced to retire. "I actually think one of the proudest achievements our team has ever done is to get that boat ready for the race," he added. "And then to be in the race for two days and hit something was a really brutal setback. You ask yourself why it has happened? "But we have turned it into a positive and spent the last four years working for this next race and I feel 100% confident in the boat, confident in the team and I think we can really do something in this race." The Vendee begins on 10 November and will end around 90 days later in France. Golding, Thomson and Davies all hope they can secure yet more success in what has been a glittering year for British sport. "I try not to dream too much about it but wouldn't it be fantastic to do it after Bradley's success in the Tour and our success at the Olympics and bring home a victory in the Vendee," said Thomson. "That would be a fantastic end for Great Britain."